Regulation (EC) No 852/2004 of the European Parliament and of the Council (4) lays down general hygiene rules applying to all foodstuffs and Regulation (EC) No 853/2004 of the European Parliament and of the Council (5) lays down specific hygiene rules for products of animal origin. The scope of the specific control rules should mirror the scope of the specific hygiene rules for food business operators laid down in Regulation (EC) No 853/2004. However, Member States should also carry out appropriate official controls to enforce national rules established in accordance with Article 1(4) of that Regulation. They may do so by extending the principles of this Regulation to such national rules. It is appropriate to provide for the adaptation of certain specific control rules, through the transparent procedure provided for in Regulation (EC) No 852/2004 and Regulation (EC) No 853/2004, to provide flexibility in order to accommodate the specific needs of establishments which use traditional methods, have a low throughput or are located in regions that are subject to special geographical constraints. The procedure should also allow pilot projects to take place in order to try out new approaches to hygiene controls on meat. However, such flexibility should not compromise food hygiene objectives. Official controls on the production of meat are necessary to verify that food business operators comply with hygiene rules and respect criteria and targets laid down in Community legislation. These official controls should comprise audits of food business operators ‘activities and inspections, including checks on food business operators’ own controls. 2. It shall apply only in respect of activities and persons to which Regulation (EC) No 853/2004 applies. 3. The performance of official controls pursuant to this Regulation shall be without prejudice to food business operators' primary legal responsibility for ensuring food safety, as laid down in Regulation (EC) No 178/2002 of the European Parliament and of the Council of 28 January 2002 laying down the general principles and requirements of food law, establishing the European Food Safety Authority, and laying down procedures in matters of food safety (7), and any civil or criminal liability arising from the breach of their obligations. ‘health mark’ means a mark indicating that, when it was applied, official controls had been carried out in accordance with this Regulation. When Community legislation requires the approval of establishments, the competent authority shall make an on-site visit. It shall approve an establishment for the activities concerned only if the food business operator has demonstrated that it meets the relevant requirements of Regulations (EC) No 852/2004 and (EC) No 853/2004 and other relevant requirements of food law. When, in accordance with Article 5 of Regulation (EC) No 852/2004, a food business operator uses procedures set out in guides to the application of HACCP principles rather than establishing its own specific procedures, the audit shall cover the correct use of these guides. 6. Verification of compliance with the requirements of Regulation (EC) No 853/2004 concerning the application of identification marks shall take place in all establishments approved in accordance with that Regulation, in addition to verification of compliance with other traceability requirements. The health marking of carcases of domestic ungulates, farmed game mammals other than lagomorphs, and large wild game, as well as half-carcases, quarters and cuts produced by cutting half-carcases into three wholesale cuts, shall be carried out in slaughterhouses and game-handling establishments in accordance with Section I, Chapter III, of Annex I. Health marks shall be applied by, or under the responsibility of, the official veterinarian when official controls have not identified any deficiencies that would make the meat unfit for human consumption. Official auxiliaries may assist the official veterinarian with official controls carried out in accordance with Sections I and II of Annex I as specified in Section III, Chapter I. In that case, they shall work as part of an independent team. To ensure the uniform application of the principles and conditions laid down in Article 11 of Regulation (EC) No 178/2002 the procedures laid down in this c+hapter shall apply. 3. The competent authorities of third countries appearing on lists drawn up and updated in accordance with Article 11 shall guarantee that lists of the establishments referred to in paragraph 1 are drawn up, kept up-to-date and communicated to the Commission. any special import conditions established in accordance with Article 18(19). 6. The other Member States shall have three months from the receipt of a notification referred to in paragraph 5 to send written comments to the Commission. The Commission may, and when it receives written comments from one or more Member States shall, consult Member States within the committee referred to in Article 19(1). The Commission may decide, in accordance with the procedure referred to in Article 19(2), whether the envisaged measures may be implemented subject, if necessary, to appropriate amendments. Where appropriate, the Commission may propose general measures in accordance with paragraphs 1 or 2 of this Article. before proposing implementing measures on the matters referred to in Article 18(5) to (15). 1. The Commission shall, not later than 20 May 2009, submit a report to the European Parliament and the Council reviewing the experience gained from the application of this Regulation. Directive 2004/41/EC of the European Parliament and of the Council of 29 April 2004 repealing certain directives concerning food hygiene and health conditions for the production and placing on the market of certain products of animal origin intended for human consumption (9). 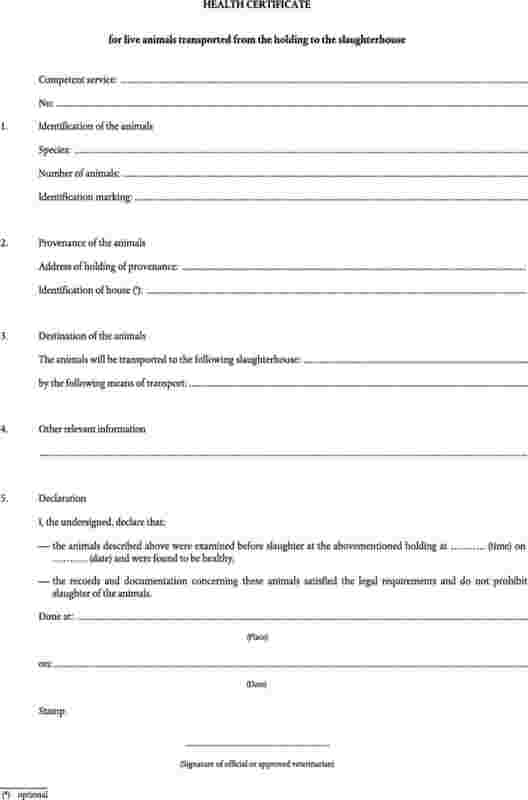 In the case of emergency slaughter outside the slaughterhouse and of hunted wild game, the official veterinarian at the slaughterhouse or game handling establishment is to examine the declaration accompanying the body of the animal issued by the veterinarian or the trained person in accordance with Regulation (EC) No 853/2004. In the event of an emergency slaughter, the carcase shall be subjected to post-mortem examination as soon as possible in accordance with paragraphs 1 to 4 before it is released for human consumption. Meat from animals having undergone emergency slaughter outside the slaughterhouse must bear a special health mark, which cannot be confused either with the health mark provided for in this Chapter or with the identification mark provided for in Annex II, Section I, to Regulation (EC) No 853/2004. When the official veterinarian, while carrying out ante-mortem or post-mortem inspection or any other inspection activity, suspects the presence of an infectious agent mentioned on OIE List A or, where appropriate, OIE List B, the official veterinarian must immediately notify the competent authority and both must take all necessary measures and precautions to prevent the possible spread of the infectious agent in accordance with applicable Community legislation. The official veterinarian is to verify compliance with the food business operator's duty pursuant to Regulation (EC) No 853/2004 to ensure that animals accepted for slaughter for human consumption are properly identified. The official veterinarian is to ensure that animals whose identity is not reasonably ascertainable are killed separately and declared unfit for human consumption. Whenever the official veterinarian considers it necessary, official controls are to be carried out on the holding of provenance. The official veterinarian is to verify compliance with the food business operator's duty under Regulation (EC) No 853/2004 to ensure that animals that have such hide, skin or fleece conditions that there is an unacceptable risk of contamination of the meat during slaughter are not slaughtered for human consumption unless they are cleaned beforehand. When the rules concerning the protection of animals at the time of slaughter or killing are not respected, the official veterinarian is to verify that the food business operator immediately takes necessary corrective measures and prevents recurrence. Where the establishment has used good hygiene practice in accordance with Article 4(4) of this Regulation and the HACCP procedure for at least 12 months, the competent authority may authorise staff of the establishment who have been trained in the same way as the official assistants and have passed the same examination to carry out tasks of the official auxiliaries and form part of the competent authority's independent inspection team, under the supervision, direction and responsibility of the official veterinarian. 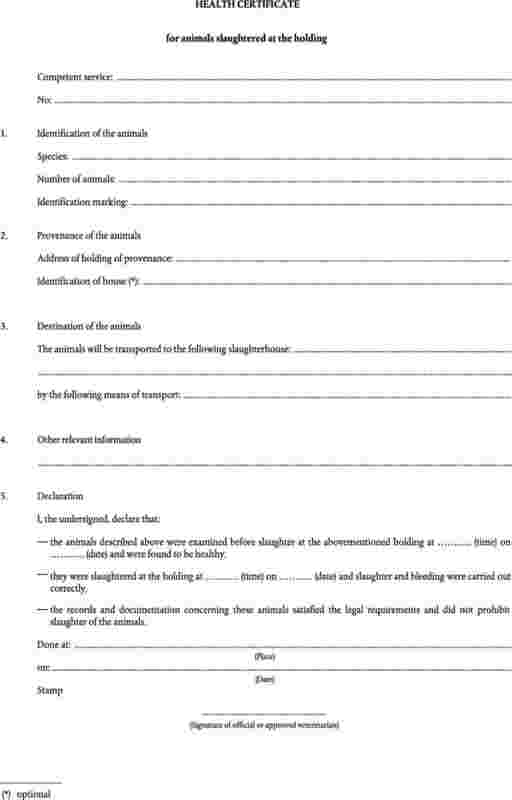 In these circumstances, the official veterinarian shall be present at ante-mortem and post-mortem examinations, shall supervise these activities and carry out regular performance tests to ensure that the performance of the slaughterhouse tasks meets the specific criteria laid down by the competent authority, and shall document the results of those performance tests. Detailed rules for the performance tests shall be laid down in accordance with the procedure set out in Article 18. Where the level of hygiene of the establishment is affected by the work of this staff, where this staff does not carry out the tasks properly or where in general this staff carries out its work in a manner that the competent authority considers unsatisfactory, this staff shall be replaced by official auxiliaries. Candidates may acquire the required knowledge as part of their basic veterinary training, or through training undertaken, or professional experience acquired, after qualifying as veterinarians. The competent authority may arrange for different tests to take account of candidates' background. However, when the competent authority is satisfied that a candidate has acquired all the required knowledge as part of a university degree, or through continuing education resulting in a postgraduate qualification, it may waive the requirement for a test. Training and tests are to concern principally red meat or poultrymeat. However, persons who undergo training for one of the two categories and passed the test need only undergo abridged training to pass the test for the other category. Training and test should cover wild game, farmed game and lagomorphs, where appropriate. all grey or white horses must be inspected for melanosis and melanomata by examination of the muscles and lymph nodes (Lnn. subrhomboidei) of the shoulders beneath the scapular cartilage after loosening the attachment of one shoulder. The kidneys must be exposed and examined by incision through the entire kidney. In the case of poultry reared for the production of ‘foie gras’ and delayed eviscerated poultry slaughtered at the holding of provenance, ante-mortem inspection is to be carried out in accordance with paragraphs 2 and 3. 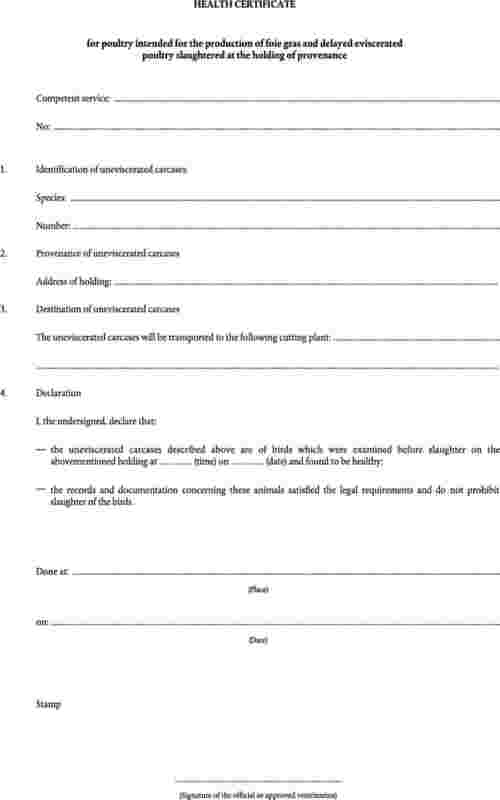 A certificate conforming to the model set out in Part C is to accompany the uneviscerated carcases to the slaughterhouse or cutting plant. In the case of poultry reared for the production of ‘foie gras’ and delayed eviscerated poultry obtained at the holding of provenance, post-mortem inspection is to include a check on the certificate accompanying the carcases. When such carcases are transported directly from the holding to a cutting plant, post-mortem inspection is to take place at the cutting plant. Ante-mortem inspection may be carried out at the holding of provenance when the requirements of Annex III, Section III, to Regulation (EC) No 853/2004 are satisfied. In this case, an official veterinarian or an approved veterinarian is to carry out ante-mortem inspection. The official veterinarian is to take account of the declaration or information that the trained person involved in hunting the animal has provided in accordance with Regulation (EC) No 853/2004. In addition to the cases provided for in Section II, Chapter V, meat presenting during post-mortem inspection any of the characteristics listed in paragraph 3(e) of Part A is to be declared unfit for human consumption. The post-mortem inspection procedures described in Chapters I and IV are the minimum requirements for the examination for cysticercosis in bovine animals over six weeks old and swine. In addition, specific serological tests may be used. In the case of bovines over six weeks old, incision of the masseters at post-mortem inspection is not compulsory when a specific serological test is used. The same applies when bovine animals over six weeks old have been raised on a holding officially certified to be free of cysticercosis. Meat from animals in which post-mortem inspection has revealed lesions indicating acute infection with brucellosis is to be declared unfit for human consumption. In the case of animals reacting positively or inconclusively to a brucellosis test, the udder, genital tract and blood must be declared unfit for human consumption even if no such lesion is found. The competent authority may classify as being of Class A areas from which live bivalve molluscs may be collected for direct human consumption. Live bivalve molluscs taken from these areas must meet the health standards for live bivalve molluscs laid down in Annex III, Section VII, Chapter V, of Regulation (EC) No 853/2004. The competent authority may classify as being of Class B areas from which live bivalve molluscs may be collected, but placed on the market for human consumption only after treatment in a purification centre or after relaying so as to meet the health standards referred to in paragraph 3. Live bivalve molluscs from these areas must not exceed the limits of a five-tube, three dilution Most Probable Number (MPN) test of 4 600 E.coli per 100 g of flesh and intravalvular liquid. Sampling plans to check for the presence of chemical contaminants must enable the detection of any overshooting of the levels laid down in Commission Regulation (EC) No 466/2001 (13). The competent authority is to monitor classified production areas from which it has forbidden the harvesting of bivalve molluscs or subjected harvesting to special conditions, to ensure that products harmful to human health are not placed on the market. Official controls on pectinidae harvested outside classified production areas are to be carried out in fish auctions, dispatch centres and processing establishments. Such official controls are to verify compliance with the health standards for live bivalve molluscs laid down in Annex III, Section VII, Chapter V, to Regulation (EC) No 853/2004 as well as compliance with other requirements of Annex III, Section VII, Chapter IX to that Regulation. fishery products containing biotoxins such as Ciguatera or other toxins dangerous to human health. However, fishery products derived from bivalve molluscs, echinoderms, tunicates and marine gastropods may be placed on the market if they have been produced in accordance with Section VII of Annex III to Regulation (EC) No 853/2004 and comply with the standards laid down in Chapter V, point 2, of that section. Animals on milk production holdings must be subject to official controls to verify that the health requirements for raw milk production, and in particular the health status of the animals and the use of veterinary medicinal products, are being complied with. These controls may take place at the occasion of veterinary checks carried out pursuant to Community provisions on animal or public health or animal welfare and may be carried out by an approved veterinarian. The competent authority is to monitor the checks carried out in accordance with Annex III, Section IX, Chapter I, Part III, to Regulation (EC) No 853/2004. If the food business operator has not corrected the situation within three months of first notifying the competent authority of non-compliance with the criteria with regard to plate count and somatic cell count, delivery of raw milk from the production holding is to be suspended or — in accordance with a specific authorisation of, or general instructions from, the competent authority — subjected to requirements concerning its treatment and use necessary to protect public health. This suspension or these requirements are to remain in place until the food business operator has proved that the raw milk again complies with the criteria. a sequence of pages numbered so as to indicate that it is a particular page in a finite sequence (for example, ‘page 2 of four pages’). (4) Page 3 of this Official Journal. (5) Page 22 of this Official Journal. (7) OJ L 31, 1.2.2002, p. 1. Regulation as last amended by Regulation (EC) No 1642/2003 (OJ L 245, 29.9.2003, p. 4). (8) OJ L 273, 10.10.2002, p. 1. Regulation as last amended by Commission Regulation (EC) No 813/2003 (OJ L 117, 13.5.2003, p. 22). (9) OJ L 157, 30.4.2004, p. 33. (10) OJ L 147, 31.5.2001, p. 1. Regulation as last amended by Commission Regulation (EC) No 2245/2003 (OJ L 333, 20.12.2003, p. 28). (11) OJ L 125, 23.5.1996, p. 10. Directive as amended by Regulation (EC) No 806/2003 (OJ L 122, 16.5.2003, p. 1). (12) OJ L 121, 29.7.1964, p. 1977/64. Directive as last amended by Commission Regulation (EC) No 21/2004 (OJ L 5, 9.1.2004, p. 8). (13) OJ L 77, 16.3.2001, p. 1. Regulation as last amended by Regulation (EC) No 655/2004 (OJ L 104, 8.4.2004, p. 48).